Over 30,000 delegates gathered in Toronto for the Annual Convention, Trade Show and Investors Exchange of the Prospectors and Developers Association of Canada from March 2nd to 6th. 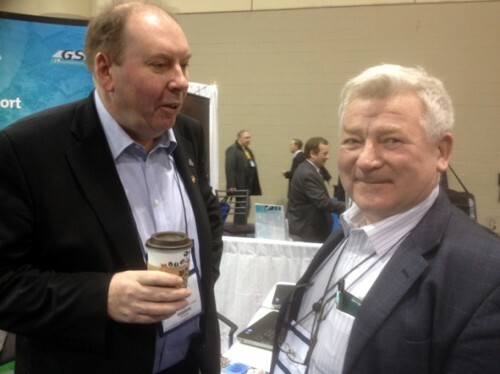 PDAC is the largest international mining convention in the world and Irish expertise was well represented. Ireland was again represented at the Trade Show by the Department of Communications, Energy & Natural Resources which encompasses the Exploration & Mining Division, the Geological Survey of Ireland and Geoscience Ireland, together with the Department of Enterprise, Trade and Investment which encompasses the Geological Survey of Northern Ireland. This cross-border initiative has been in place for over 20 years. The DCENR delegation was led by Dr Eibhlín Doyle. GI Members exhibiting at PDAC were Aurum Exploration and SLR, both of which have offices in Canada. Other GI companies in attendance were BGR and QME.Irish based companies present included Boliden Tara Mines, Conroy Gold & Natural Resources, Moydow Resources, Dalradian Resources, Davy, Minco plc, IMC, IRE Ltd., Aiken & Co. and Greencastle Resources. The larger multinationals exploring in Ireland i.e. Teck, XSTRATA and Vedanta were also present. A wide range of Irish geologists and engineers working across several continents were also present, many of whom hold senior executive and board positions in major companies. Convention Speakers from Ireland included Gerry Stanley of GSI; John Ashton of Tara Mines and Colin Andrew of RAK Resources LLC. On 7th March, Sean Finlay of GI met Ireland’s Ambassador to Canada, Ray Bassett and Hilary Reilly, Deputy Head of Mission in Ottawa.